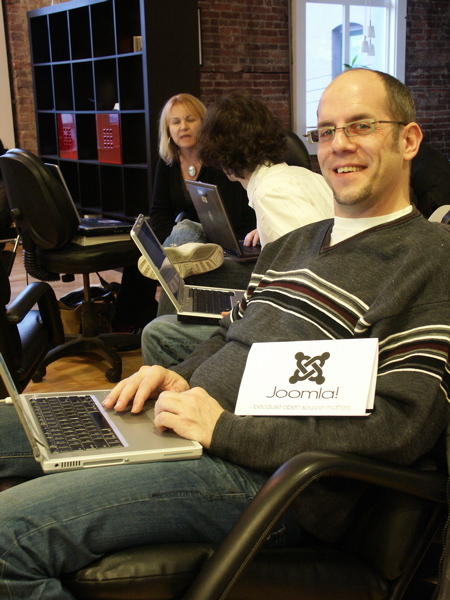 Who were the people at the Vancouver Joomla DocCamp? In my previous post I promised to write a little more about the people who participated in this weekend’s Joomla DocCamp in Vancouver. A lot of these people are quite active in the Vancouver’s technology community and having the opportunity to work with them side by side is an energizing experience. My business Partner and Associate, Jen is the founder of JenTekk Web Solutions and also the co-founder of Tazzu Networking Ltd. a business and technology networking community in Vancouver. Jeannette is a web designer who has developed several projects in Joomla! CMS such as ClassicBindery.com and North49.com websites. JenTekk Web Solutions was one of the Vancouver Joomla DocCamp sponsors. Jen was interested in the Joomla Article and Menu manager, and how they are used to achieve a proper information architecture in a Joomla powered website. You can read her blog post here: Joomla DocCamp – Fun to the finish! This charming couple are the founders of PeerGlobe Technology solutions and their specialty is developing custom Content Management Systems (CMS), Facebook, Open Social, and Mobile applications. Kim is the creative force behind the Marketing, Communication, and Design solutions in the PeerGlobe team. Ash is a Ruby On Rails (ROR) expert who has recently started using Joomla 1.5 framework for their project. Joomla 1.5 framework follows the Model View Controller (MVC) software architecture which is very similar to the ROR framework. The new PeerGlobe.com website is now powered using the Joomla 1.5 framework. PeerGlobe is an rmd Studio associate and one of the sponsors of the Vancouver Joomla DocCamp event. Monica Hamburg ( MonicaHamburg.com ) is a writer, researcher, actor, film director, and producer who is living in Vancouver, BC. She is smart, very charming, and a great person to work with. I personally love her sense of humor and sarcasm! You can read her blogs at ( Your Dose of Lunacy and Me Like The Interweb: ) and her very insightful articles on the One Degree online magazine. Feelin’ Joomla is the article that Monica has written about the Vancouver Joomla DocCamp event and the Joomla! 1.5 content management system. 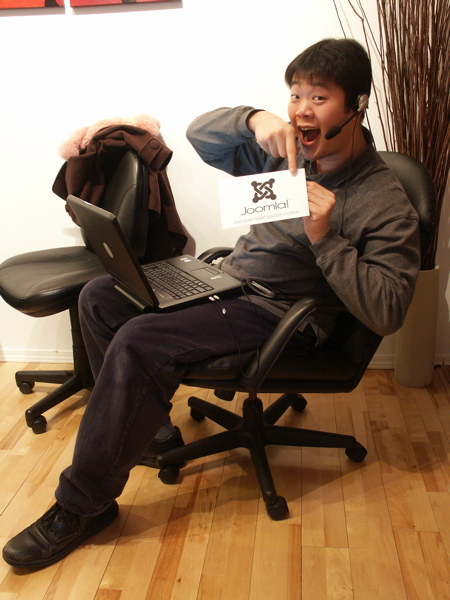 My good friend and supporter, Robert Park ( his blog: Catalyse This) is a Catalyst at The Network Hub. This organization was established in 2006 with the goal of helping first time entrepreneurs to find fundings from investors and venture capital companies. I would like to call The Network Hub a nursery for the startup companies. 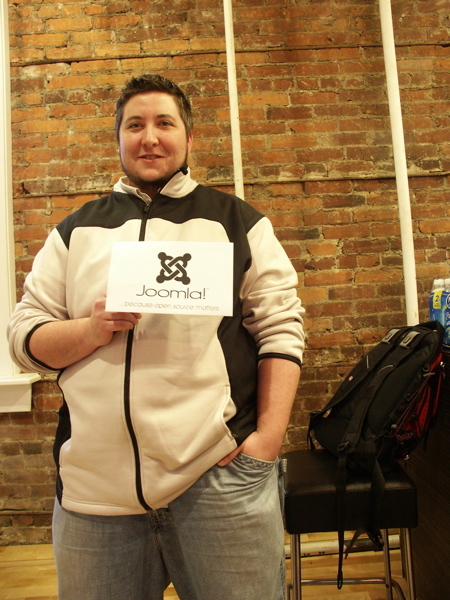 I know Jacob from our Business & Technology Community Tazzu.com and he was attending Joomla! DocCamp to become more familiar with this new CMS and Web Application Development framework. Jacob has a Bachelor of Technology in Technology Management from BCIT. You can read Jacob’s blog at SipOfWater.com where he writes about Web Development, Administration, and other technology related topics. Gwyn is a senior undergraduate student at SFU and soon will be finishing his studies in Mathematics and Economics. We first met Gwyn we he joined our first Joomla BugCamp in 2007. Gwyn is calm mannered, smart, and in love with technology. 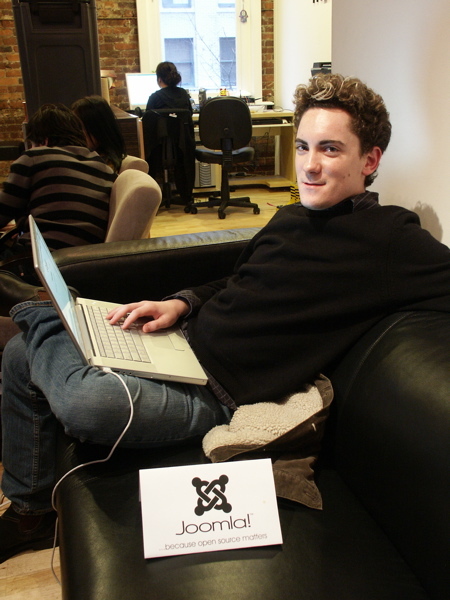 He is currently operating several web projects, one of them is GoodBoog.com. We met Erica at the Network Hub during the Joomla! DocCamp event, and after explaining to her about the concept we were working on, she decided join us. Erica is the Founder & Editor-in-Chief of The Style Spy, a beautiful online Fashion and Lifestyle shopping guide. This was Erica’s first encounter with the Joomla! CMS 1.5 and after spending the rest of the day with us playing with the administration and front-end user interface she supported the idea of having a Joomla event so we could teach website owners how to build and organize information in a Joomla Powered website. Bruce appeared out of thin air at the door. 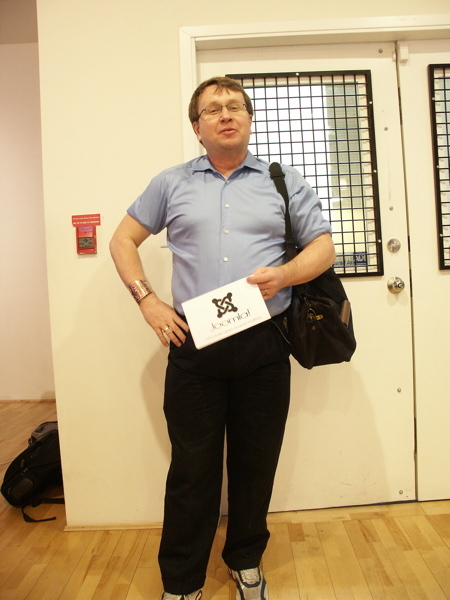 He is an accomplished writer and journalist for sites such as Linux.com and the IT Managers Journal. What you see on his right arm is in fact an Interadimensional Time Travel machine which he uses to go to different locations and gather exciting news. You can read more about him on Wikipedia and his blog Off The Wall. David is a Computer Scientist and Software Developer, graduated from UBC. 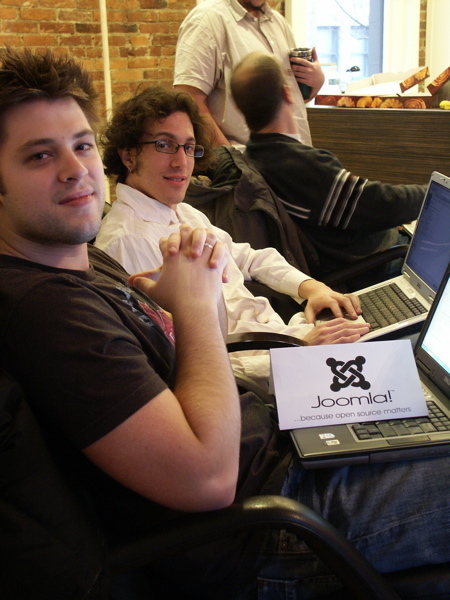 Mike and Dave are business associates, and they joined the Joomla DocCamp event to learn more about the Joomla! CMS framework and write about it. The goofy face in this picture is me, the founder of rmd Studio Inc. and Co-Fouder of Tazzu Business & Technology community. I am self employed as a Web Application Architect and volunteer my time as a Development Work Group member in the Joomla! CMS project development team. I organized the Vancouver Joomla DocCamp event with the help of OpenSourceMatters.org, The Network Hub, Jeannette, Ash, Tazzu community members, and many other open source technology enthusiasts in Vancouver, BC area. I would like to thank all the people who donated their time this weekend to be a part of our event, and I hope they have all enjoyed this session of discussion and collaborative writing. Nice list, I was curious who some faces were! Wow, am I being compared to Doctor Who? I bet all time lords get to have companions! Thanks Ratsin again for the great help you provided and an awesome report you made here! You’re most welcome Wilco, we had loads of fun actually! I am looking forward to more. People asked for Joomla DemoCamp events so we could learn more about Administrating Joomla powered websites, Template Design, and Software Development. Please sir, can we have s`more? Like Oliver Twist, I sir, am hungry for another bowl! I am all for events that facilitate participants learning from each other in these unconference type events. What a great article Rastin. Its great to be able to see all the smiling faces again, and know more about each one! @Jen – That’s a great article! Thank you very much. Really, really nice, thanks Rastin! Thank you Amy! There are some videos from the event too. I’ll post them as soon as I get the chance. Next Next post: The flexible UI – What happenend at the Vancouver Adobe AIR workshop?